I identify myself with Generation X, and sometimes I look down a little bit on Millennials as a group. Kids these days, right? However, according to a recent article I read on the Vanguard web site (hat tip: my dad), Millennials are doing a better job of saving and cash management than ever those of us in Gen X did when we were that age. According to the article, which focuses on a research report from Financial Finesse, Millennials are pros when it comes to saving money and managing what little cash they do have. Because Millennials have really experienced the Great Recession as they’ve entered adulthood, they understand the value of stretching a dollar. “The difficult economic times have had a large bearing on why they are managing their money particularly well, despite the fact that, on average, they earn the least of other generations,” the article points out. The reason? Millennials aren’t afraid to be thrifty. Many of us in Gen X grew up wanting to look rich and successful. I went through that phase myself in college. I got a credit card, and immediately stopped worrying about money. This credit card allowed me to go to Las Vegas and go on shopping sprees. It looked like I had money to spend, when really it was all on credit. Now, though, there is a movement toward frugality. As the Vanguard article points out, many Millennials think it’s cool to get a good deal. Instead of bragging about how much they spent on something (like many in older generations), they brag about how little they spent. Getting a bargain is the new cool. As a result, Millennials aren’t afraid to move back home, live on the cheap, and say “no” to spending when they don’t have the money. Even though Millennials are better at penny pinching, though, the article points out that they are putting their futures at risk. Only 29% have run a retirement projection. 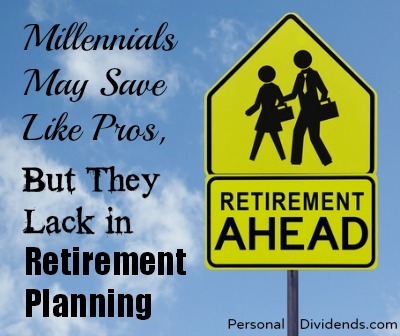 This means that most Millennials have no idea how much they need to save for retirement. Only 17% are on track to replace 80% of their income during retirement. Many Millennials are too risk averse, thanks to the crash in 2008, and the impact seen on their parents. As a result of these retirement planning realities, many Millennials might not be ready for the future. While the emphasis on better cash management is good, and it’s great that Millennials are saving money, it’s also important that they not get so caught up in the penny pinching that they forget about building wealth for the future. In fact, that’s good advice for the rest of us, too. While you do want to manage your money responsibly, it’s important to remember to use investing to build your wealth as well. It really is difficult to build wealth if you do not have good saving habits. Spending less than you make helps contribute to your savings and being thrifty helps you to spend less. Work hard and save consistently and you will be find over the long haul.